Oliver James asserts that the nature vs. nurture debate is settled: a new book (his own) has 'proved' that genes have no influence on 'psychological traits'. Nurture has won the battle. To be fair, I was a badly behaved slacker who was always at or near the bottom of every class (the weekly beatings did not help). I'm with the headmaster here, except that before giving up on the brat entirely I would have tried daily beatings, since weekly ones didn't seem to be working. Setting aside his defective grasp of scientific method and 'proof', our 'chartered psychologist and psychotherapist' assumes that 'nature', that is, the physical make-up of a person, is totally encompassed by genetic inheritance. It is not, as a moment's reflection will show. Many aspects of a human's physical constitution are not determined by his or her genetic constitution. Arguing that no one has ever found a gene that is responsible for a brittle personality or hyperactivity does not mean that such features of personality may not have physical causes. And such physical causes my result from the presence of combinations of genes. Einstein, Feynmann and co. had powers of mathematical imagination that were surely not just the result of the way they were brought up and whether their parents loved them or not. Nor can 'psychological traits' (only psychologists use such phrases) be entirely the result of nurture. When parents are talking about their children I have often heard them emphasise their personality differences rather than their similarities: one child is outgoing, another child is reserved and so on. Given the same nurture we might expect more uniformity. In the animal kingdom, some species are more intelligent than others, others more aggressive, some exhibit pack or herd behaviour and so on. Even Oliver James must admit that genes have something to do with these differences. His headmaster was definitely right. Hands on the chair, boy! 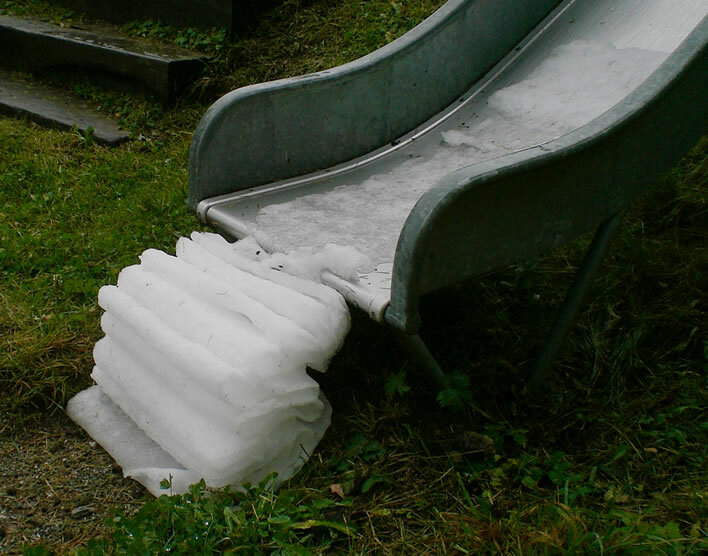 16.02.2016 – Swiss snow having orderly fun in the playground. Not sure what an 'adverse risk' is. Perhaps she means a 'serious' or a 'dangerous' risk. In the context of flying a helicopter, can we think of risks with trivial outcomes – lunchbox falls out of open window – or even beneficial outcomes – and falls on head of David Cameron? Nevertheless, the phrase 'adverse risk' was clearly so gripping that it was repeated in a picture caption and a strapline. Will it catch on? I've always liked the one about the insomniac dyslexic agnostic who would lie awake at night wondering whether there really was a Dog. What's the difference between an etymologist and an entomologist? An etymologist knows the difference. Ask them to pronounce 'unionized'. I invented a new word today: 'plagiarism'. I tried walking up a hill without a watch but had neither the time nor the inclination. There's a fine line between numerator and denominator. I saw a dwarf prisoner climbing down a wall. He turned and sneered at me. I thought: 'that's a little condescending'. I missed Question Time last week having been stuck on the A1 in a huge traffic jam. Fortunately for me the program invited me down to Llanelli to take part in this week’s program. There –that wasn't too hard, was it. Makes you seem a much nicer man. I only read it to see if I could find the p-word, 'private'. I assume he is relatively well-off. As such he would be a fool to expose himself to the indignities of the soup kitchen that is the National Health Service. Not a peep. In fact there was no word about the hospital, the staff, the surgeons or anything about the treatment, which I would have imagined is something the grateful survivor of an operation would want to mention. The only hint is that Holmes had a single room. We can therefore assume that it was private medicine. Had it been the NHS the piece would have been full of the noisome 'angels in uniform' guff and a photo or two of suitably diverse groups of grinning minders. I can't find a word to describe the making of such politically tactical omissions. We have plenty of words to categorize the things people say, but not many to describe what they don't say. Dissembling?